The second coming of the A7, Audi’s take on the four-door coupe trend kicked off by the Mercedes-Benz CLS. It’s a more rakish, sloping, low-slung sister car to the upcoming A6 saloon, with a hatchback boot and a focus on design touches that make onlookers coo and nod reverentially like they’re surveying a fine art gallery. You wanted Audis to look a bit different, and carry some bravado? Here you go. The designers got so obsessed they even moved the fuel filler cap so it didn’t foul the styling line. We may have reached Peak German. Audis always major on design attention to detail, often more than absolute driving pin-sharpness. So the A7 ought to be Audi’s absolute comfort zone. And in many ways, this ice-cool express really is. 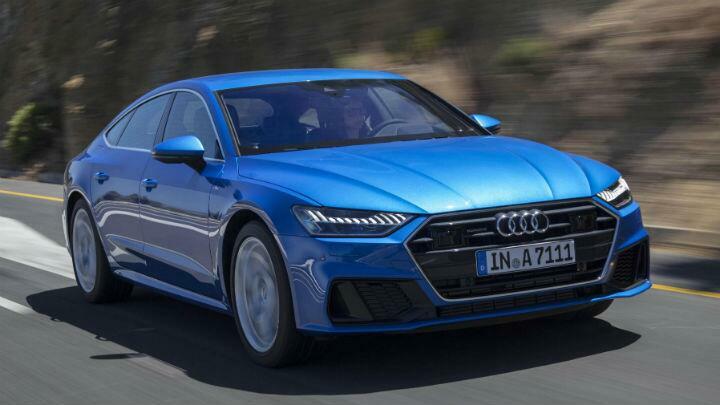 A great deal of A7 Mk2 is shared with the latest Audi A8 – the chassis building blocks (now much more prevalent in steel than aluminium), the interior technology, and the mild-hybrid 48-volt drivetrains. While you’re not posted about town via an electric motor, what the system can do is store regenerative braking energy as electricity and totally switch off the engine when you’re coasting, between 54kph and 158kph. So, for downhill stretches of motorway, the engine is off entirely. Transmission declutched, and away you go. The stop-start system also cuts in long before you’re actually, er, stopped. At 21kph, if the computer senses you’re heading for traffic, it’ll turn off whichever of the turbocharged petrol or diesel powerplants you’ve selected for your A7. At launch, it’s a V6-only zone. Audi’s needlessly bonkers new naming ideology badges the petrol as ‘A5 55 TFSI’. In the real world, we’ll call it a 3.0 TFSI bi-turbo with 335bhp and 471Nm. It’ll haul the A7 from 0-100kph in 5.3 seconds and on to 248kph in a blink. Helping massage those figures is a new version of the quattro 4x4 system, titled ‘quattro ultra’. First used in the A4 Allroad, the drivetrain keeps the A7 entirely front-wheel drive to reduce friction, until it senses you’d like twice as much traction. A seven-speed dual-clutch gearbox is standard on the petrol model. Future four-cylinder versions will lower the A7’s price point. The diesel option right now is the 3.0 TDI or ‘A7 50’, as Audi would have it. No, neither do we. Anyway, this isn’t the car to save the turbodiesel. You get a worse gearbox (an eight-speed auto), an older version of quattro that’s heavier and less efficient, and a less pleasant engine. Despite being the raffish, more devil-may-care cousin to an A6 or A8, the A7 hasn’t abandoned all common sense and practicality. It has five seats. The 535-litre boot can swell to encompass 1,390 litres with the rear seats folded (not quite flat). Audi’s quite proud of the fact you can now carry two loaded golf bags and a spare wheel at the same time. Sounds like they know their customer base to, ahem, a tee. There’s a lot of complication to tuck into with the A7. There are four options of suspension type: standard steel springs, 10mm lower sports springs, electronically controlled adaptive damping, or fully adaptive air suspension. Phew. Later in 2018, there’ll also be part-autonomous ‘AI’ functions for remote parking and even leaving the A7 to garage itself. Tony Stark, your time is now. One thing you’ll be sure of on all A7s is its sexiest signature detail: that spectacular rear LED strip housing 13 vertical elements that illuminates, switches off and indicates in a variety of animated flourishes. Well, Audi’s got to get its valued customers to start using their indicators somehow. Time was a diesel was the default choice for a big barge, but think twice here. The 3.0 TDI unit is, in isolation, a sorted engine with a broad power band. But when you’re exposed to the 3.0 TFSI petrol, you’re instantly aware the diesel has a rougher start-up and increased vibrations. Worst of all, the eight-speed automatic gearbox it’s been paired with is off the pace compared to the far slicker, swifter seven-speed dual-clutch mated to the petrol A7. Often, dual-clutchers struggle in town and conventional autos panic in a “full warp please, Mr. Zulu” situation, Not here. You find yourself tiptoeing around the automatic’s tardy responses, so the less torquey petrol ends up making smoother, more effortless progress. The petrol V6, if anything, might be too quiet for its own good. It’s an uncannily silent, whispering mime artist of an engine. Utterly extraordinary – that’s the A8’s influence, and Audi’s investment in a new, soundproofed bulkhead and adaptive engine mounts paying its due. Thing is, the 48-volt electrical ancillaries layer this murmuring with a prevailing whine, like a supercharger. Your passengers may ask if it’s an electric car, because of that distant, high-pitched ‘wheeee’ emanating from the bowels of the engine bay. Now, options. Do have the rear-wheel steering. You want to wield that manoeuvrability in town – RWS shrinks the turning circle by a metre. You’ll never notice the extra stability on the motorway but, (like a smoke alarm or the SAS) it’s nice to know it’s working away discreetly in the background. Dynamic steering, on the other hand, which makes up its own mind about how much steering lock is required depending on your current speed, doesn’t gel with the system and makes the A7 come across haphazard and unreassuring through corners. Being based on an A8, with no actual hardware changes to suspension and steering, the lower A7 wasn’t intended to have the handling smarts of a Panamera or, say, a Jaguar XJ. The steering’s twirly-light in all three of its modes, and could use more resistance just to trickle some confidence into your hands when you’re aiming such a large barge. It’s glassy and remote, and makes the car feel aloof. Underneath that there are huge grip reserves, and the ‘ultra’ quattro brain never betrays it’s only front-drive most of the time. And then there’s the ride. Now, we’ve only tried the adaptive air suspension so far. Through the Comfort, Balanced and Dynamic settings of the Drive Select menu, it reins in the A7’s mass professionally and handles compressions smartly, thanks very much. The trap isn’t the suspension – it’s the wheels. A7s get 19s as standard, and you can option 20s or 21s. Oof, it does looks handsome on 21s. But you simply cannot have them, because they obliterate the ride. Resonant thuds crash through the structure as the ferris wheels rumble over road acne. There’s simply not enough wheel travel to get any absorption done, and the tyres are practically painted on, so forget it. You could stick to 19s, but then the A7 assumes the stance of a pool table on trolley castors. So, it’s twenties, then. Happily, an S-line model wearing the 20-inch rims oozes along with acceptable compliance and manners, gearbox behaving, engine whispering, and wheeeeeee-ing under max attack load. You arrive into the A7’s cabin and immediately think: “Whoops, I’ve boarded the wrong car. This is an A8.” All of the touchscreen technology and a large amount of the Blade Runner universe airport lounge ambience have been copy-pasted from Audi’s limousine. But there are some tweaks, to hint the A7 is a bit schportier, a bit more the machine you’d prefer to drive than be driven in. The horizontal sweep of gloss black dash ends next to the touchscreen, instead of stretching across the cabin entirely. The main infotainment centre is angled slightly towards the driver. And there are prominent grab handles in the doors, instead of subtle cut-outs for your hands. In the A7 S-line the steering wheel has been rethought – same functions, fewer spokes. Subtle stuff, but it does make the A7 feel a little less statesmanlike. It’s a designer suit but with the top button undone and the cuffs rolled up. So, those screens, then. Haptic feedback is Audi’s answer to operating vast panes of glass while remaining in control of 1,800kg of spaceship canal boat. So, like your smartphone, little pulses of vibration greet each tap of your fingertip, to register the action. It’s a more expensive sensation than an unanimated screen, and does help define what’s being selected. Take note, Range Rover Velar. Is it as easy to operate eyes free as the last-gen MMI clickwheel? No, not yet. But with familiarity, it’s very slick. The menus are logical and friendly, and the graphics are exquisite. And being a new-age Audi, you can pretty much choose to ignore the main touchscreen if you’d like, and just cycle through nav, trip and music on the 12.3-inch Virtual Cockpit instruments. Obviously the material choice is tasteful, the build and finish millimetre-perfect, and the general ambience quite clinical and businesslike. Minimalism instead of richness. We’ll focus instead on what the A7 does differently. Chiefly, that’s obviously to sacrifice headroom in the name of a rakish shape, right? Happily, nope. Headroom has increased a meagre 5mm versus the old A7, but regardless, this is easily commodious enough to recline three adults behind two adults, if you catch my drift. The new platform has carved out another 21mm of legroom, too, and the boot has remained exactly the same size as the last A7, but optimised to better suit golf bags. And, a quick word of praise for Audi not skimping on the plushness in the cheap seats. Sometimes, luxury cars wow you with supple leathers and cool metals up front, only to cheekily swap in plastics in the back seat, because hey, won’t somebody think of the children? The sheer amount of convincing metal throughout the A7’s cockpit is incredible – don’t drive past any hospitals in it or you’ll get teleported into the MRI room. But even in the rear seat, the fillets of brushed aluminium, the touchscreen climate control and soft fittings continue to impress. That’s not cheap to do, and the A7 practically bleeds quality for it. The A7 family is a doddle to wrap your head around. ‘Base spec’ is the Sport, which gets full LED lights, 19-inch alloys, double-glazing (really) front and rear parking sensors and a back-up camera, plus non-adaptive cruise control and anti-collision braking with lane-keep assist. Thinking of upgrading to the fully-intelligent cruise control? Bear in mind that Audi’s latest system automatically reads speed limits and will override your commands to make time on a quiet evening’s motorway running. Just thought you ought to know. The only other model is S-line, which heaps on tech and more exterior attitude. You get the matrix LED lights with the animated flourishes, 20-inch rims, a 10mm ride height drop (but no comfort/sporty modes), a subtle bodykit that really suits the A7’s form, and extra metal inlays to lift the cabin’s darkness. Heated front seats, and a powered tailgate are standard. You can add massaging seats (some of the very best in the business) and ambient lighting with a choice of 30 colours, if you’re both rich and indecisive. Audi’s deliberate ploy to not make a driver-centric Panamera rival out of the A7 actually suits it, even if the resulting car is pretty clinical. This isn’t a luxury sports saloon – it’s a luxury limousine dressed in a rakish, designer suit. Think about how it suits the type of driving that so many of us are confined to: traffic (let the car take over, enjoy the world-class interior), and monotonous motorway (marvel at the tranquil silence aboard). We’re also not in the least bit qualified to comment on this, but here goes: the A7 is also very cool. It has presence. It’s an interesting looking big German boat, without being fussy, and its technology is presented so beautifully, it doesn’t come across as nerdy or baffling. Wafting along in its 22nd Century hotel suite cockpit, with the engine often imperceptibly asleep, economy soaring, is an extremely relaxing, if not entirely memorable, way of getting around. And did we mention it’s cool? You’ll need to avoid the 21-inch wheels, because they utterly ruin the A7’s serenity, and the 55 TFSI is the engine of choice for the time being. A Porsche Panamera is a more rounded machine overall, but the A7’s Grand Designs form is more daring and less expensive. It simply asks where your priorities lie.